Ultra Interview with Indo-German - Ultra International B.V.Ultra International B.V.
Ultra recently contributed to an interview undertaken by the Indo-German Chamber of Commerce. The IGCC support German companies wishing to do business in India on maters like taxation, legal services and recruitment. Over the last 7 years they have supported more than 170 German companies to get established in India. Details of the interview can be read below. Ultra International B.V. started in Europe 10 years ago to support the organic growth of our flavour and fragrance operations based in New Delhi, India and to establish a natural ingredient trading business in essential oils. Ultra International Ltd (New Delhi) has over 80 years industry experience in trading natural and synthetic ingredients and since 1987 in developing and manufacturing fragrances and flavours. Today Ultra holds the number one position in the Indian domestic fragrance market (of any non-multinational) and sees our long-term growth in international markets. The Sanganeria family, which owns Ultra International, is currently operating with their 2nd and 3rd generations at the helm. The family name has a long and illustrious reputation for ethical business practices and for the support of grassroots industry. The IGCC spoke to Jonpaul Howarth, Vice President – Ultra International B.V. Mr. Howarth joined Ultra International B.V. as Vice President in 2013 having served 15 years in the F&F industry. He has previously held positions as a company director and commercial roles in the UK & Australia as well as undertaking 3 years as an Executive with IFEAT. What are the characteristics and uses of essential oils and ingredients? Who are your key customers? I try to explain the use of fragrance and essential oils as the magic in every household, personal care and detergent product. Look in your bathroom or store cupboards and tell me why you like a product. Beyond its functionality it will be for the aroma – the fragrance, which comes from a formula made of various ingredients (designed by a perfumer) or from a single or group of essential oils. It is the fragrance that creates the atmosphere and is often the main reason for choosing the product you buy. When you read a label you may see the odd botanical name (from the essential oil) listed or the word ‘parfum’. Few realise that there’s a multi-billion euro industry behind this one little word. That’s our industry and our world. Our clients range from multinationals (e.g. other flavour and fragrance compounders or world leading consumer brands), to boutique producers of fine fragrance or top spa and aromatherapy products. Other clients may be major or regional traders but more often end-users, for example in the beverage industry. This year you celebrate 10 years of being in Europe. What have been your experiences of the European market so far? How have you been successful in Europe? – What are Ultra’s key strengths? Europe is a highly competitive arena. Whether in Germany, France, Spain, Netherlands, UK or now Eastern Europe, brands, producers and traders are all looking for their point of difference. In essence, Ultra’s product offering is on a par with that of any of our industry’s leading producers, whether for a finished fragrance compound or an essential oil. However, we have a very different business model that has supported us well to date. We have an efficient, streamlined infrastructure with a small team but one bursting with experience. 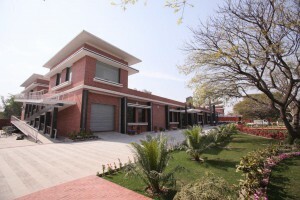 We utilise our New Delhi Creative Centre for all technical, creative, analytical, regulatory and administration work. This keeps our costs under control and enables us to offer a very competitive service that others in Europe have difficulty matching. Our personnel and technology are at times unrivalled in comparison to what many others within Europe can provide. We are also privately owned and self-financing which means we have greater flexibility and do not have to answer to anyone but to our own high standards. In addition, we have our own Indonesian company producing some key essential oils. This year we expect to be the world’s largest producer and exporter of patchouli oil (a traditional and influential ingredient in many fragrances). Other oils from our key growing partners around the world have been introduced to clients with great success as we bridge the gap between the farmer and the buyer (across various industries) adding little cost but adding a high value to the supply chain. This gives our buyers the supply and quality assurances they need, and provides farmers with confidence in our selling their products, and achieving a fair price and adhering to the industries tightening regulatory challenges. Do you see a trend towards natural and organic personal care products that are non-toxic and environmentally friendly? How does this impact your posi- tion in the market? Yes, we have seen this movement in consumer markets for many years and it is now a feature of everyday life in Europe. There are strong labels such as ‘natural’ and ‘organic’ but my favourite is ‘green’. Maybe in personal care, ‘organic’ ingre- dients can have a place but for household, detergent and fine fragrance markets I believe something ‘green’ has just as much impact. For fragrance creation this trend can be restrictive, as no longer does a perfumer have the same repertoire of ingredients to choose from. Thankfully for essential oils they are already defined as ‘green’ and ‘natural’, with greater availability coming from organic farming. For fragrance creations we are fortunate in having a good base of essential oils and producers as well as processors who can isolate different molecules, thus ensuring continued creativity with our designs. These can replace some of the many synthetic ingredients commonly found in personal care products. Of course these come at a cost. Natural (or the use of more essential oil) is more expensive than synthetics and has an element of risk (natural growing conditions) and then with organics you can expect to pay a 25-35% premium. For some products it is simply not viable. For this reason the market will find its own balance as to where and when this natural, clean trend will reach its limit in consumer markets. Ultra’s business in Europe is based on natural ingredient sales and given our position in the essential oil markets we are confident that this consumer trend can only support our organic growth policy. What are your future plans for India and Europe? We are ambitious in our thoughts but are prepared to be patient to find the best next step for our business. It is likely that expansion through acquisition (in India) and continued organic growth in Europe would suit our short-term targets. However, we are looking for the right acquisition within Europe if it brings us more control of our goal of being more vertically integrated in the natural products we offer.